Jan van Boeckel is an artist-educator, anthropologist and film-maker. Currently, he is senior lecturer in visual art education at the Academy of Design and Crafts of Gothenburg University, and guest educator and researcher at CEMUS, the Centre for Environment and Development Studies in Uppsala (both in Sweden). Before he was professor in art education at the Estonian Academy of Arts in Tallinn for three years. Jan has also been program director in design theory at the Iceland University of the Arts in Reykjavik. Jan has regularly taught at Schumacher College in Dartington, the UK; University College of Southeast Norway in Notodden; and at CEMUS, in Uppsala, Sweden. Together with others, Jan established the international research group on arts-based environmental education at Aalto University, School of Arts, Design and Architecture in Helsinki. In 2013, he presented his doctoral thesis, At the Heart of Art and Earth: An Exploration of Practices in Arts-Based Environmental Education (3rd print, Feb. 2017). In 2016, Van Boeckel was a member of the British Educational Research Association’s commission that focused on the potential and challenges of developing STEAM education through creative pedagogies. From 2014 onward, Jan is member of the research group on Art & Science in Education at the Norwegian University of Life Sciences in Ås. Since 2007, he is part of the International Eco-Art Network. In 1989, Jan van Boeckel obtained his University degree in Social Anthropology at the University of Amsterdam, with the thesis De Onthulling van het Sacrale: Inheemse Volken en de Media (The Revealing of the Sacred: Indigenous Peoples and the Media). The world-views and environmental philosophies of indigenous peoples have remained a lasting field of interest. Together with film-making group ReRun Productions, Jan produced a series of documentaries on this theme, as well as films on philosophers such as Jacques Ellul and Arne Naess, who provide a critical analysis of Western industrial society. These films include, among others: The Earth is Crying (1987), It’s Killing the Clouds (1992), The Betrayal by Technology (1992), and The Call of the Mountain (1997). In the early 2000s, Jan lived with his family in Hällefors, deep in the forests of central Sweden, where he was an art teacher to both children and adults, and consultant on international cultural projects. Here he conceptualized the international art project Cloudberry Dreams, on the cultural interpretation of wetlands. From 2004 to 2006, Jan was head of communications at the Netherlands Centre for Indigenous Peoples in Amsterdam. On basis of his inspiration by indigenous cultures, his own engagement in artmaking and teaching, and the experience of living close to wilderness in Sweden, Jan’s interest has moved to art as a mode to connect with what David Abram aptly called ‘the more-than-human-world.’ One of his research interests is the tension between trying to open the senses whilst coping with the enormity of the current ecological crisis – an issue all the more pressing when practising arts-based environmental education with young people. Presently, Jan van Boeckel is content editor for the forthcoming online project OpenAirPhilosophy which will make the writings of Norwegian ecophilosophers Arne Naess, Sigmund Kvaløy Setreng and Peter Wessel Zapffe available to a broad international audience. For a special issue of Arts and Teaching Journal Artizein, Jan was guest editor-in-chief. The theme of the edition (2017) was the triad of art, education, and the natural environment. On an ongoing basis, Jan van Boeckel has participated in and contributed to sessions on artistic research of the ArtEZ International Research school (AIR) in Arnhem, the Netherlands. In October, Jan participated and presented at the State of the Art – seminar and network meeting in Silkeborg, Denmark. Later that month he taught the intensive three day course ‘Connecting to Nature Through Art’ for and with students of the Estonian Academy of Arts in Lahemaa National Park. In April, Jan gave a presentation entitled Fostering Agility through Art at the Radical Relevances conference at Aalto University in Finland. In May, he presented a keynote (viewable online) at the three day ClimateExistence conference in Uppsala, Sweden. And in June, Jan performed together with David Rothenberg at an evening event at 42 Acres Shoreditch in London. 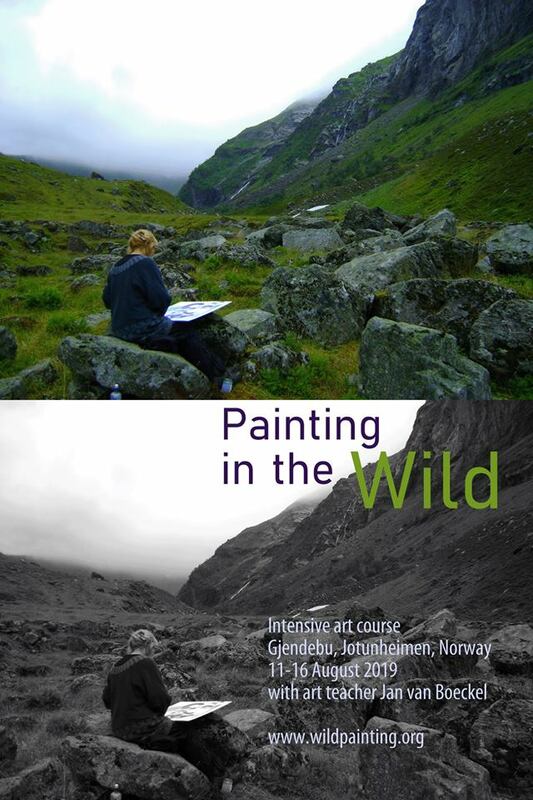 In the summer of 2019, Jan will teach Wildpainting courses on the islands of Skye (Scotland), Öland and Sydkoster (Sweden), and at Gjendebu in Jotunheimen National Park in Norway. – Painting in the Big Wide Open on the Swedish island of Öland. An 2015 interview with Jan van Boeckel can be accessed here (or at the website of the Estonian Academy of Arts). Two earlier interviews, in Dutch – one in the daily newspaper Trouw (2013) and the other as part of the book Hoor de Zon (2012) – can be read here.